We have a saying here at Babyology (well, I do, anyway) that there’s hardly a house in Australia without an Expedit. That may not be entirely true, of course, but it’s certainly the case that the Swedish furniture giant has a way of sneaking a little something into our houses time and time again. Now it’s sneaking a VERY little something into our doll houses. I don’t want to say that this news is all my Christmases come at once, but it’s certainly true that the brand new Huset dolls’ furniture set from Ikea combines two things with a soft spot in my heart – Ikea furniture and miniature stuff. 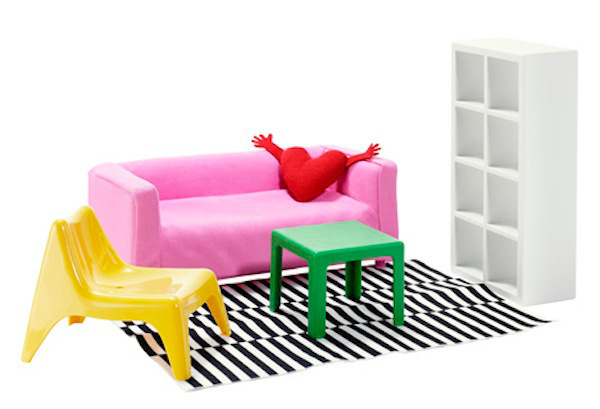 Who wouldn’t want the chance to furnish a dollhouse with tiny versions of their own furniture? It includes (among other things), miniatures of the old favourite Expedit bookshelf, the Klippan sofa and the Lack side table – all of which may just have seen some time in your house over the years. A very quick look around the web informs us that dolls from Blythe to Barbie are all quite at home on the Huset! The good news is – there’s nothing to put together in this set – not a miniature allen key in sight, and the price is quite pleasant too. After all, when did you last outfit an entire room in Scandinavian style for a mere $14.99? You can check out its availability at your nearest Ikea and pick it up in store. While you’re at it, take a look at our previous Ikea posts and our ongoing love for dollhouses.